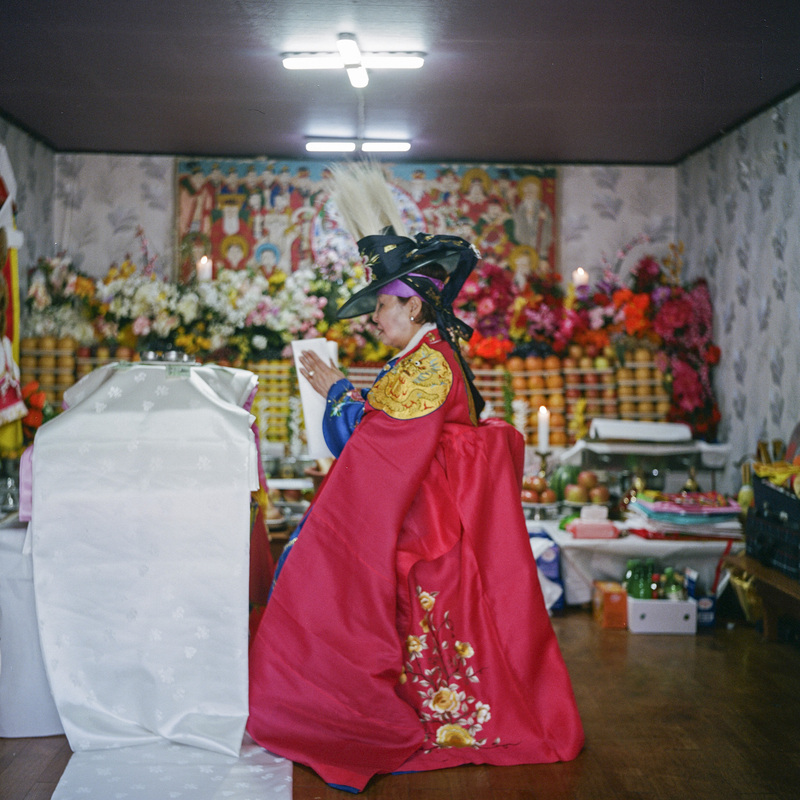 Manshin Kim Keum-Hwa carrying out a ritual at her shrine in Ganghwado, South Korea. 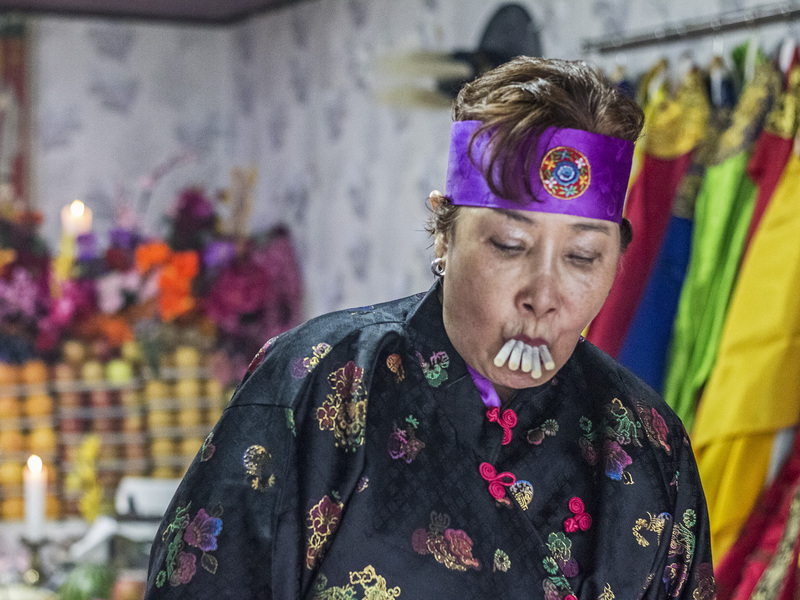 From social outcasts on the verge of extinction to living human treasures in a matter of just a few decades, Korean female shamans (manshin) and their rituals represent the nation’s most authentic and indigenous form of faith. 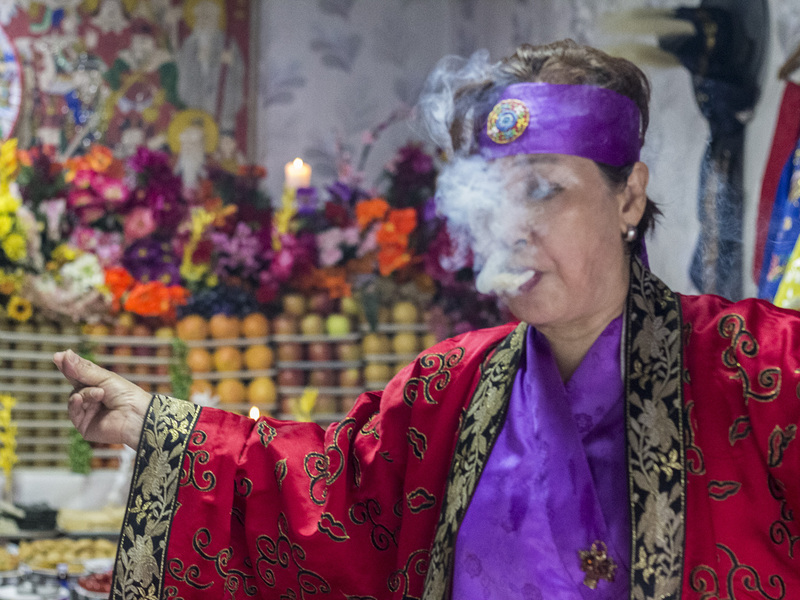 Medium, magician, healer, fortune-teller, priestess, dancer, musician and spiritual intermediary, manshin today are capable of reaching a supernatural dimension out of which life comes and goes. 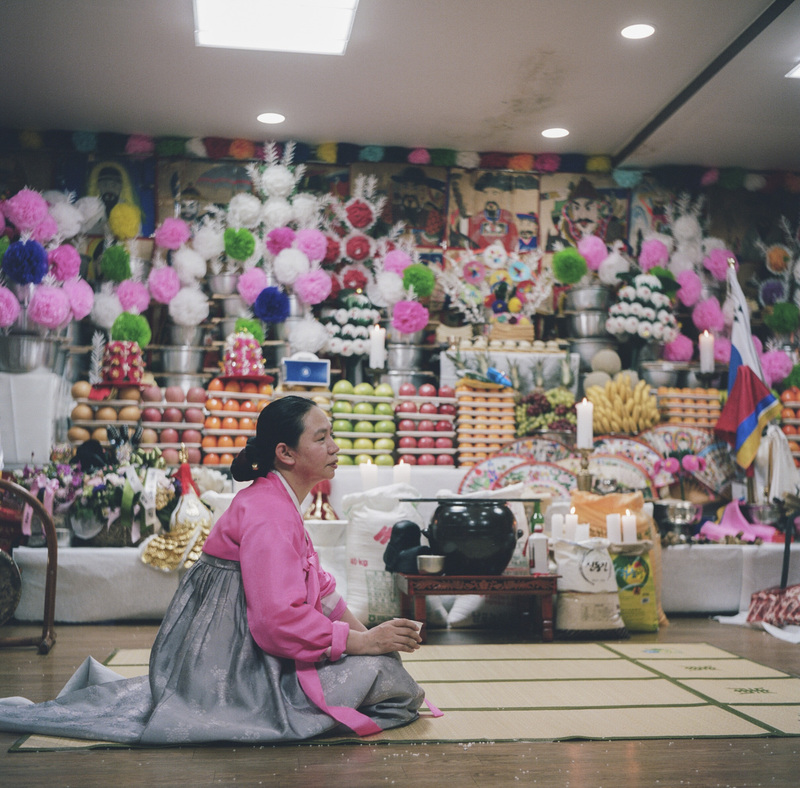 While in residence at the National Museum of Modern and Contemporary Art (MMCA), artist Jorge Mañes Rubio worked for months with several scholars and female shamans in Seoul, attending many rituals, some of them extremely private and meaningful. 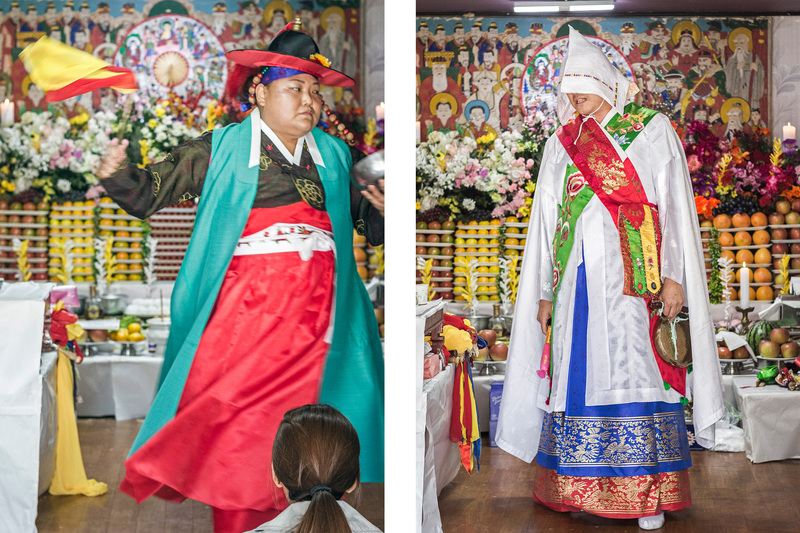 Shamans kindly shared their stories with him, stories of struggle and empowerment for these women who still today need to overcome many obstacles and prejudices. 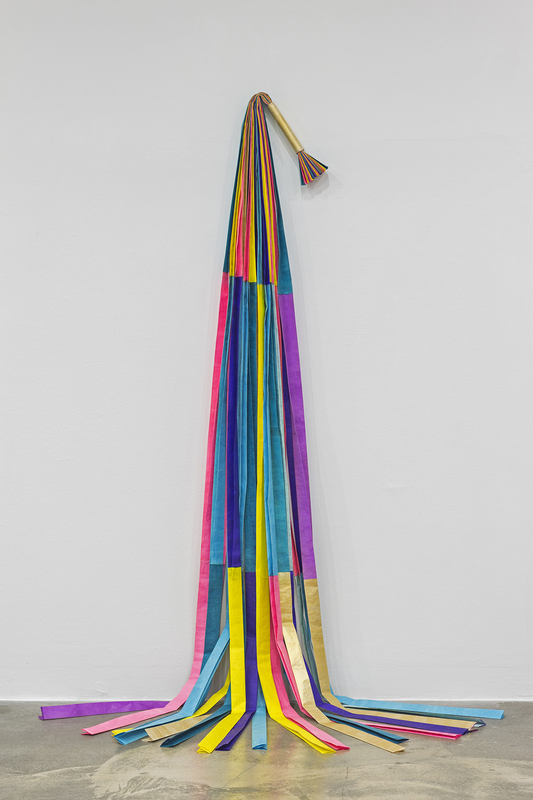 Tracing a decisive parallelism between Korean shamanism and his mystical approach to contemporary art, Jorge Mañes Rubio celebrates the revelatory and ecstatic potential of manshin, encouraging a deeper spiritual connection with the world. 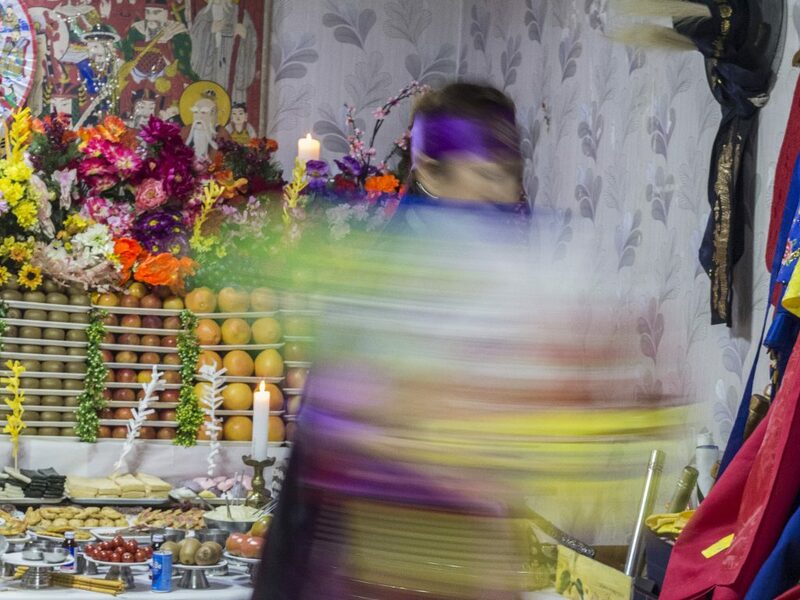 We might regard shamans and their practice as something from the past, as beautiful, rare and exotic individuals who preserve a tradition from earlier times. But traditions are constantly evolving, and I would like to think that shamanism could also be part of our future, where a better understanding of each other is being encouraged. The fact that shamanism is not an organised religion does not discredit their significance, on the contrary, to me it makes it all the way more unadulterated and authentic. We usually associate shamanism with fortune-telling, wild rituals and trance-ecstasy phenomenons, but that’s just a very small part of it. 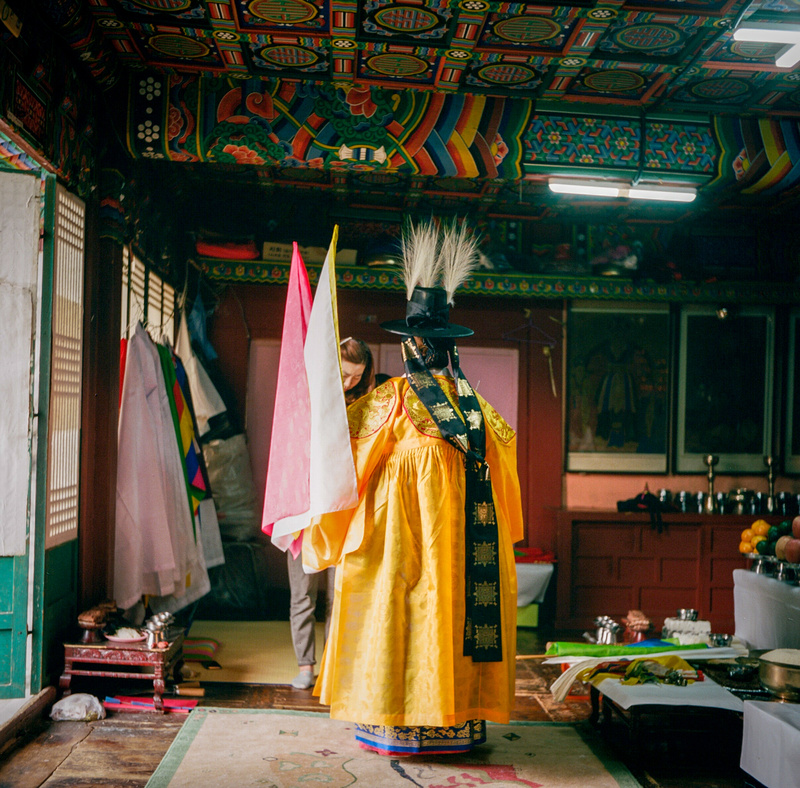 During my stay in Korea and thanks to being able to meet some very capable and powerful shamans, I’ve learnt that shamanism is a faith, is a drive that teaches compassion and spiritual balance. A shaman is the mediator who connects both human and spiritual worlds. They are people who profess an unconditional love for nature, firmly trust their indigenous beliefs and aim to live harmoniously with those who surround them. Our world definitely needs more of that. During the famous PBS TV mini-series “The Power of Myth” Bill Moyers asked Joseph Campbell: “Who interprets the divinity inherent in nature for us today? Who are our shamans, those who interpret unseen things for us?” Campbell replied: “It’s the function of the artist to do this. 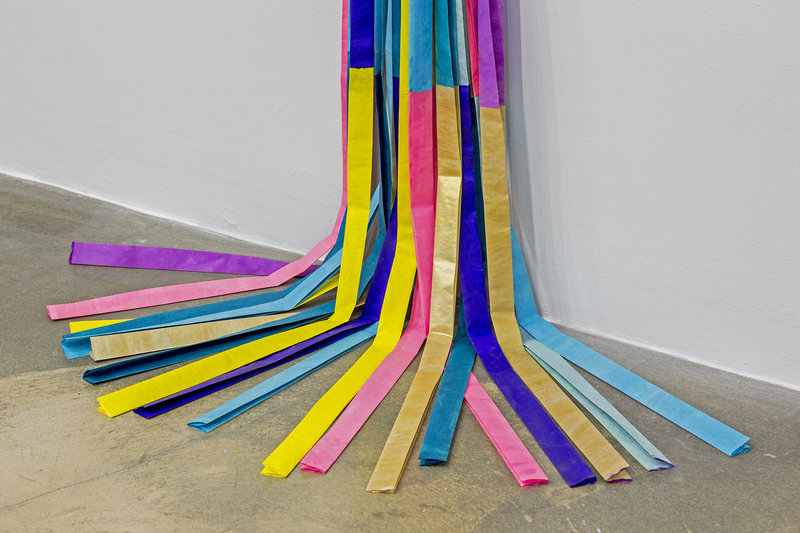 The artist is the one who communicates myth for us today.” That’s a very powerful influence. 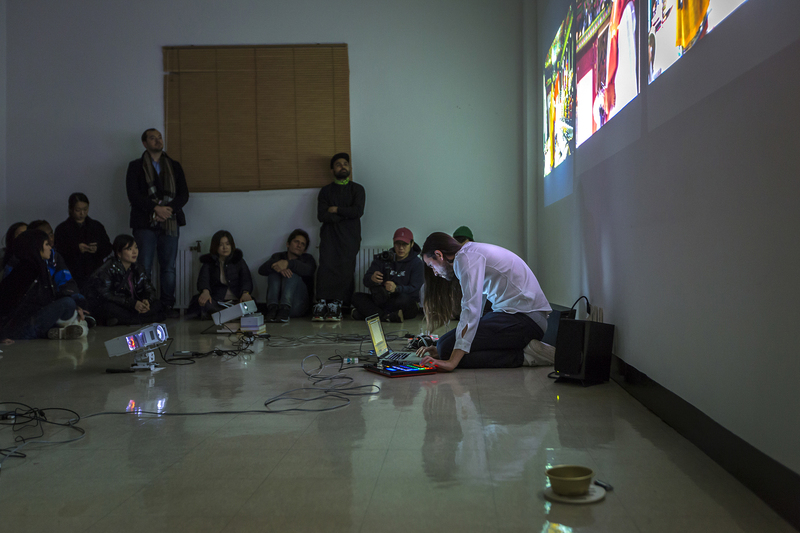 Artists might not change the world, but have the power to create small fragments of an alternative world. 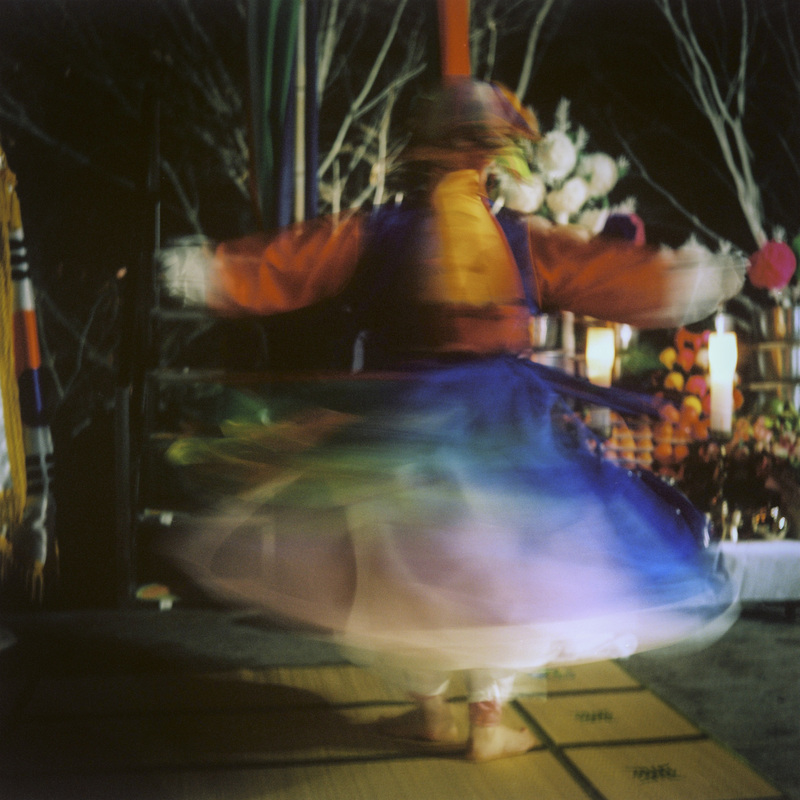 On the other hand shamans have access to an alternative reality or alternative worlds. 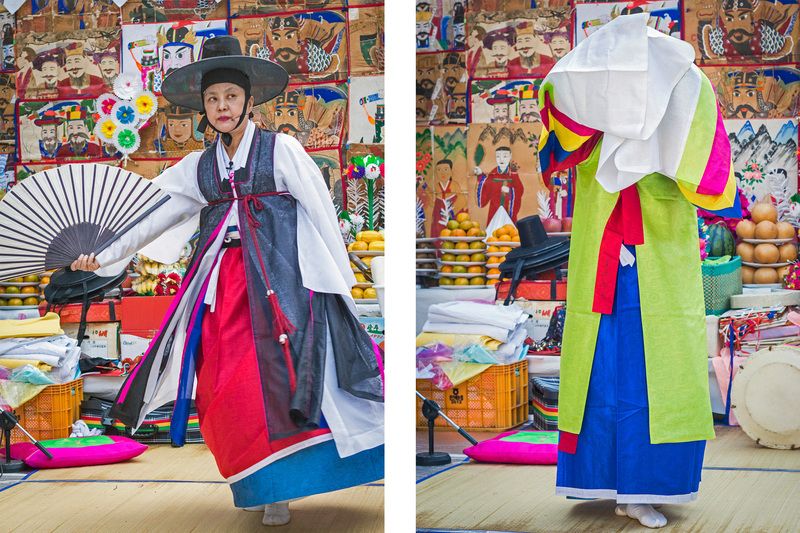 I see a decisive parallelism between artists and Korean shamans, we both share the need of rendering the invisible visible. 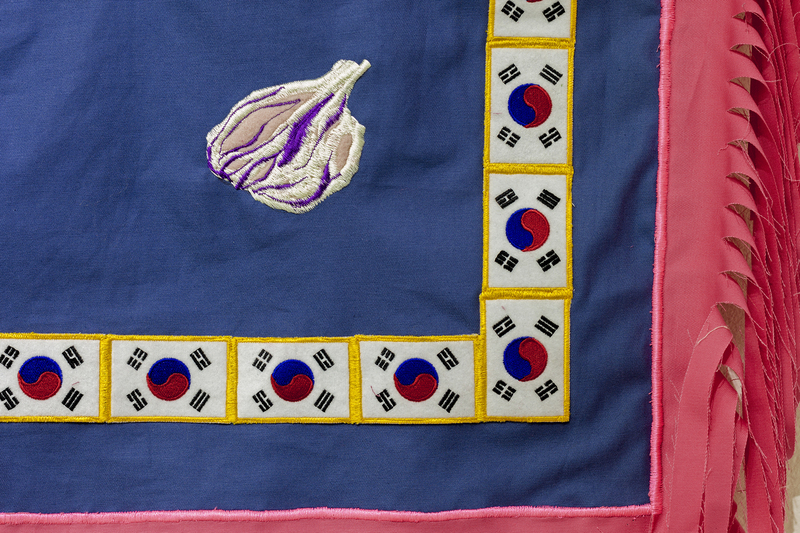 *These are excerpts from a public lecture on December 1st 2017 between artist Jorge Mañes Rubio in conversation with curator Bora Hong at the National Museum of Modern and Contemporary Art MMCA in Seoul. 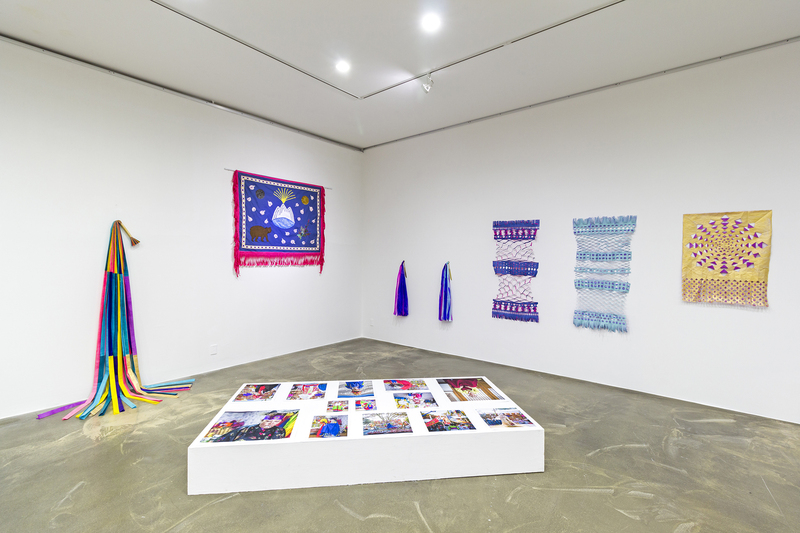 Exhibition view at MMCA Changdong, Seoul. 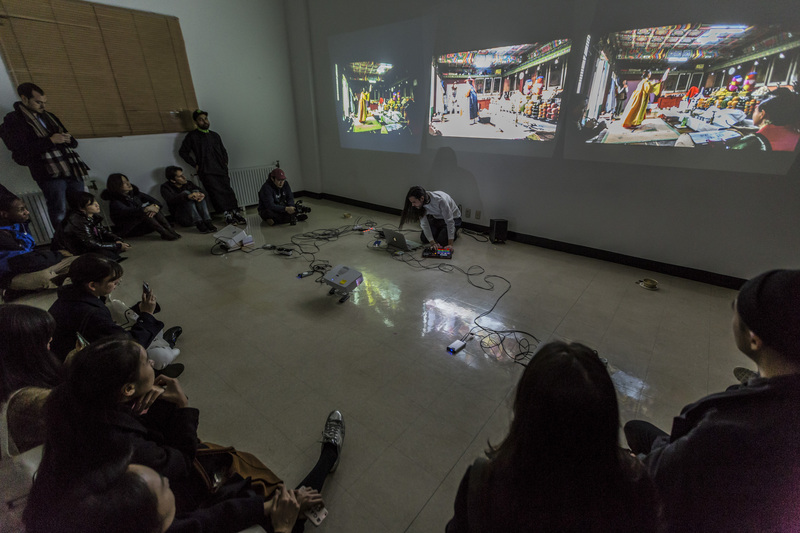 Bora Hong is an independent curator, director of Gallery FACTORY (Seoul) and publisher of independent art magazine <versus>. Dangun, the Legendary Founder of Korea. 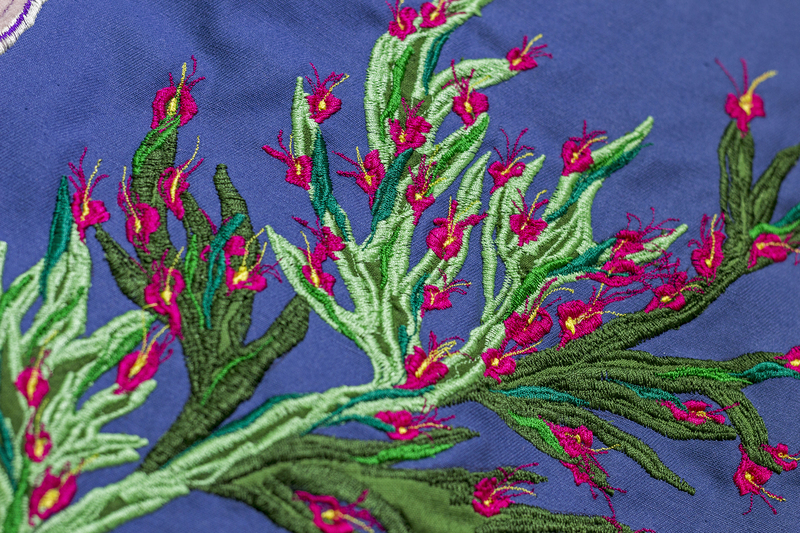 Embroidery and appliqué on cotton. 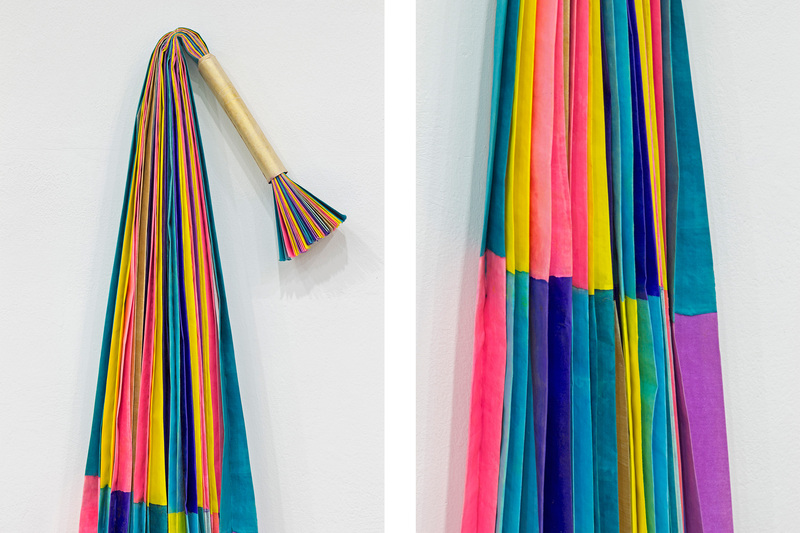 180x135cm. Dangun was the legendary founder of Gojoseon in 2333 BC. 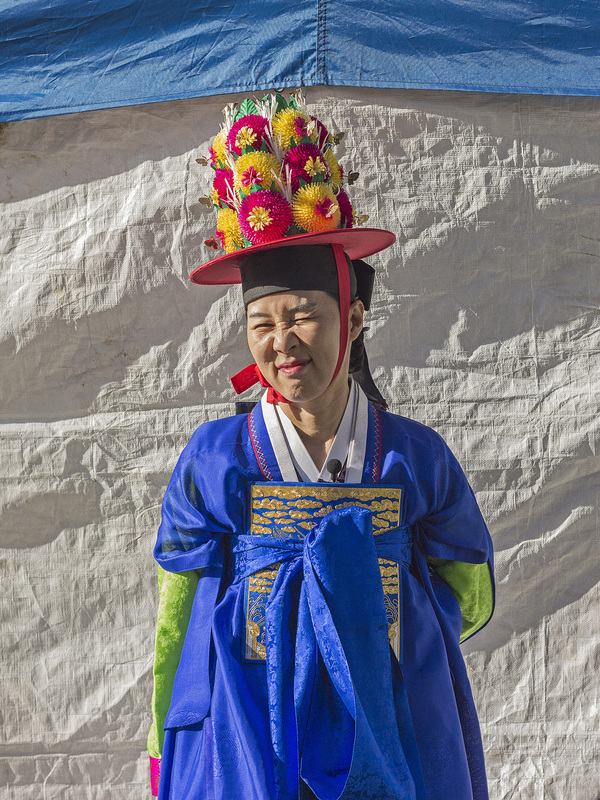 This is considered the first ever Korean kingdom, located in what now is Manchuria and the northern part of the Korean Peninsula. His is the first story in the Samguk-Yusa (Tales of the Three Kingdoms) compiled in 1280. 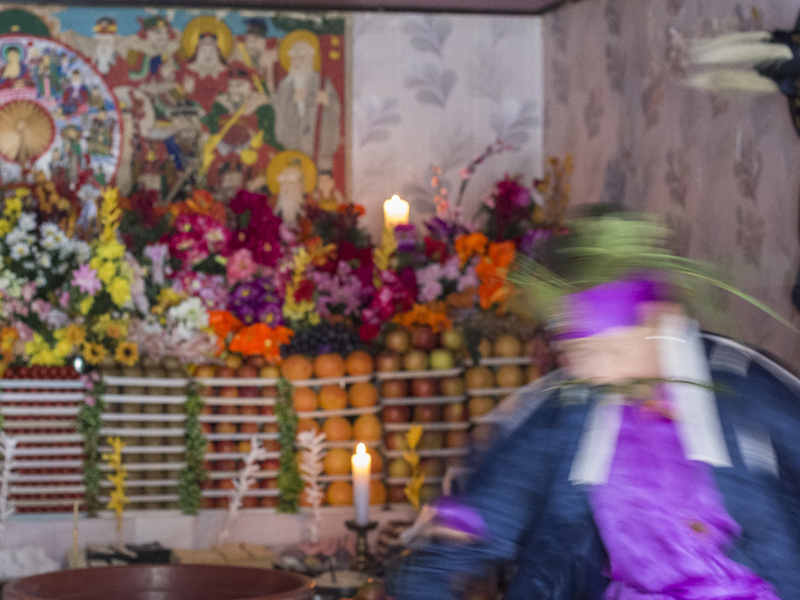 The story tells how Hwanung, the son of Hwanin, the supreme deity, asked his father if he might be allowed to descend to Earth and live there instead of heaven. 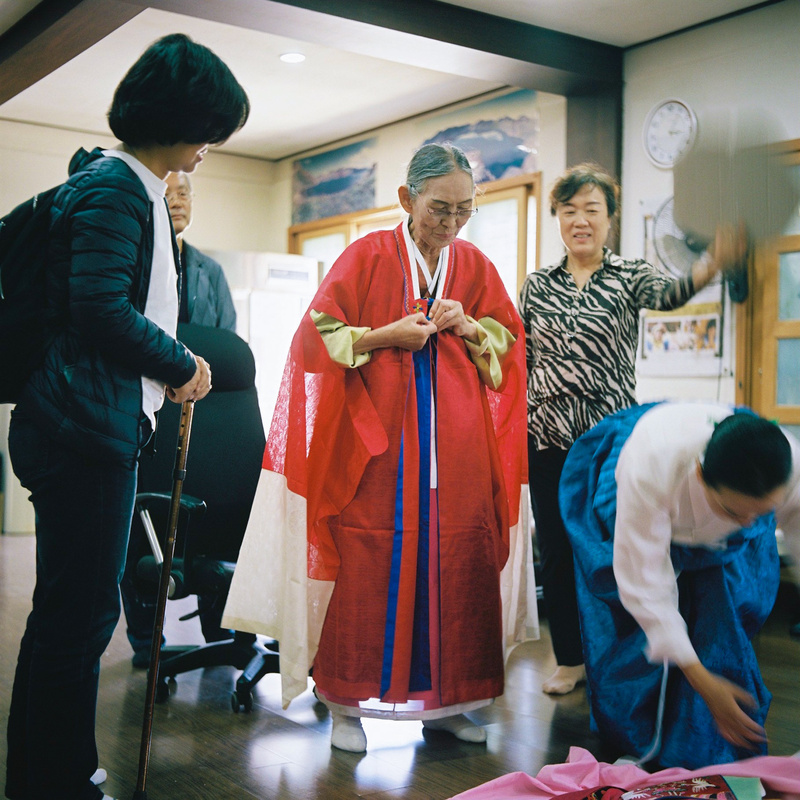 Hwanin consented and, giving Hwanung three seals of authority, selected Mt. Taebeck (near North Korea’s Pyongyang) as the best place for his son to arrive and settle together with 3000 followers. 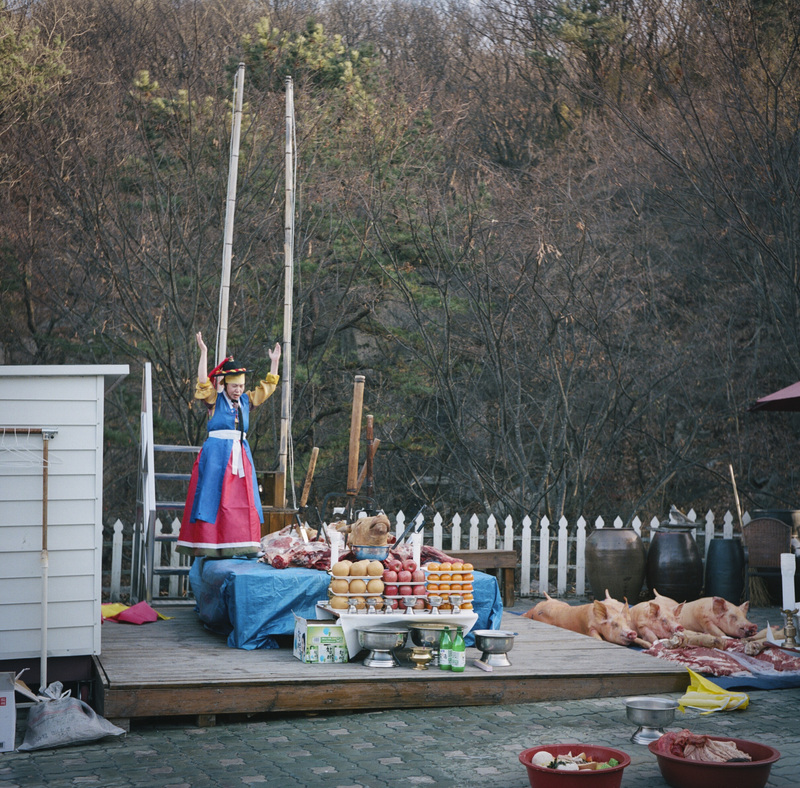 One day both a bear and a tiger came to Hwanung’s residence in prayer and asked to be transformed into humans. 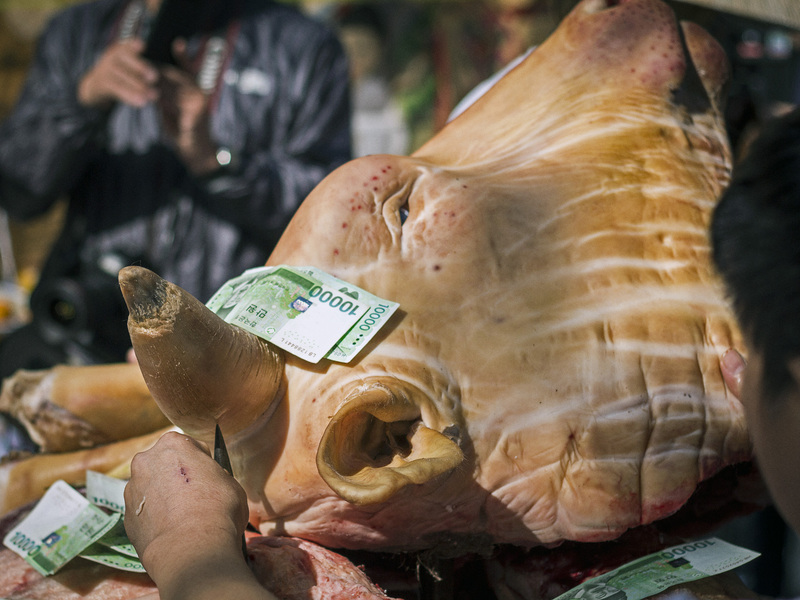 The god agreed to this gift but on the condition that they remain in a cave, out of the sun for 100 days and eat only a sacred bunch of mugworts and 20 garlic cloves. The tiger shortly gave up in impatient hunger and left the cave. but the bear – a female called Ungnyo – after only 21 days was transformed into a woman. 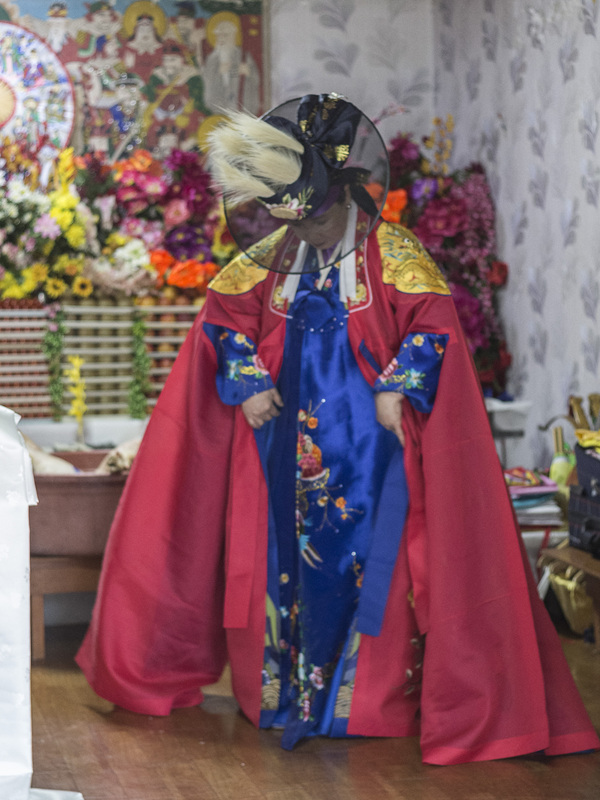 She longed for a child and so, shortly after the god married her, Dangun was born. 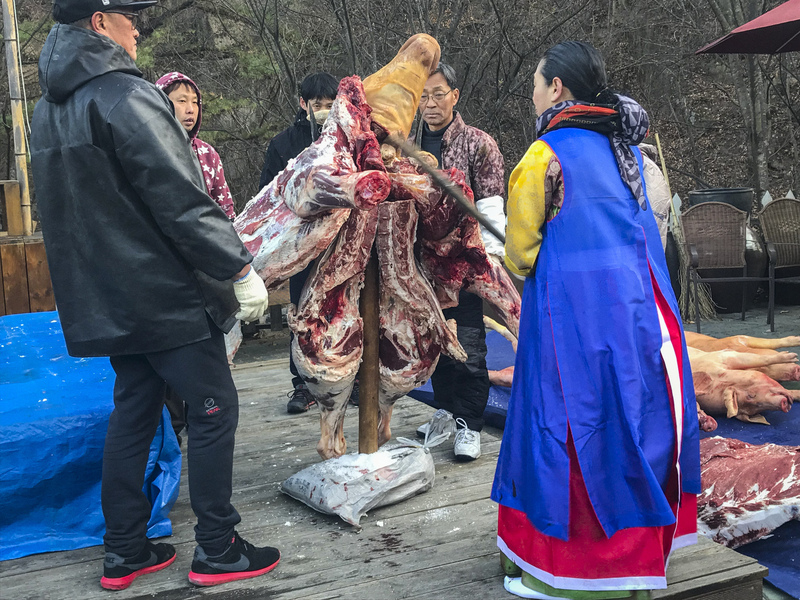 The figure of the bear in the myth probably references the shamanistic beliefs of the nomadic tribes who migrated from the Asian interior in this period and settled in the Korean peninsula, bringing shamanism with them. Dangun may be considered the first Great Shaman who provided a link between the spirit and animal world with humanity. 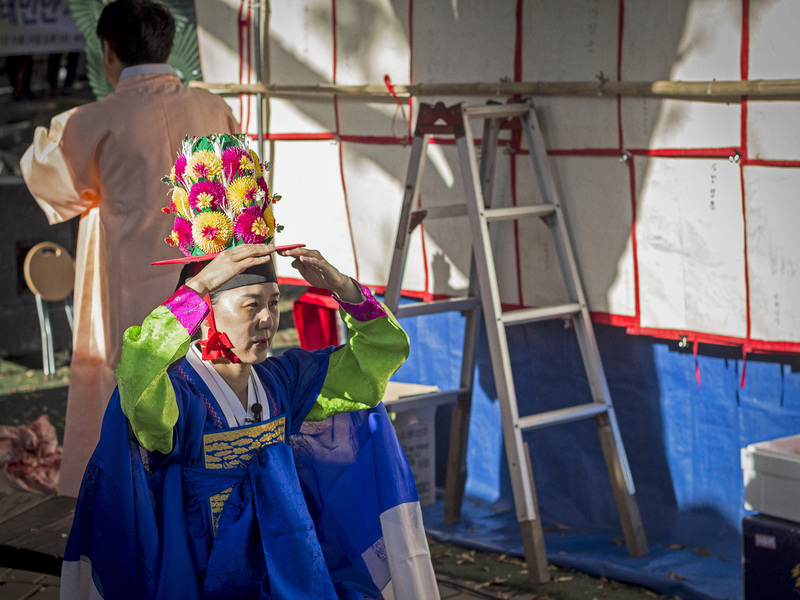 Today, many shamans across Korea still worship Dangun, who represents a symbol of hope for Korean reunification—his celebration day is the only public holiday observed jointly in both Koreas. Dangun, the Legendary Founder of Korea, detail. 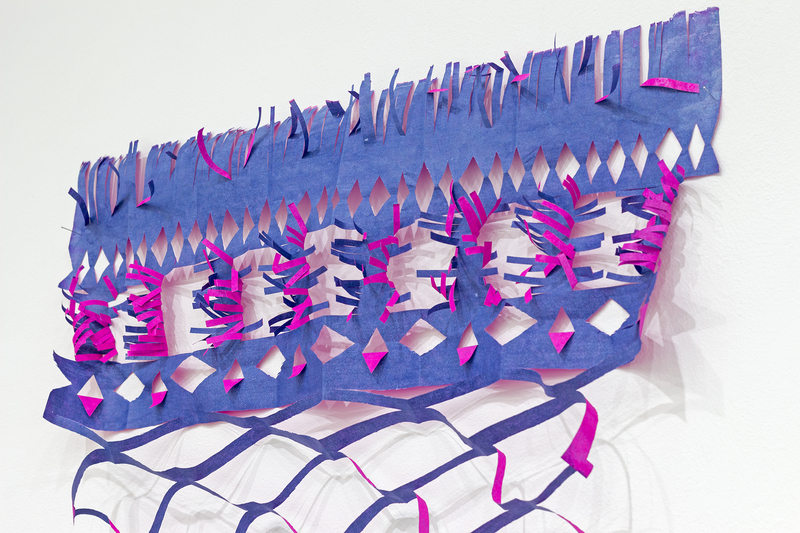 Making the Invisible Visible, pigments on paper, 280x110x70cm. 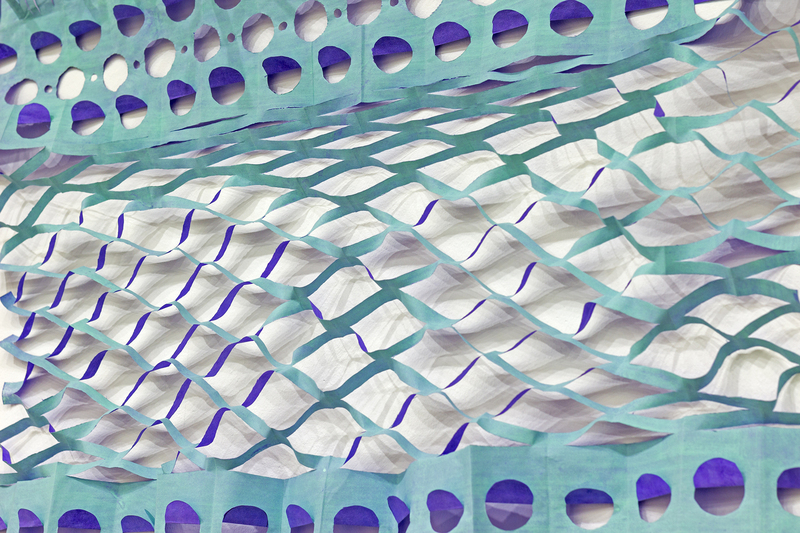 Making the Invisible Visible, detail. 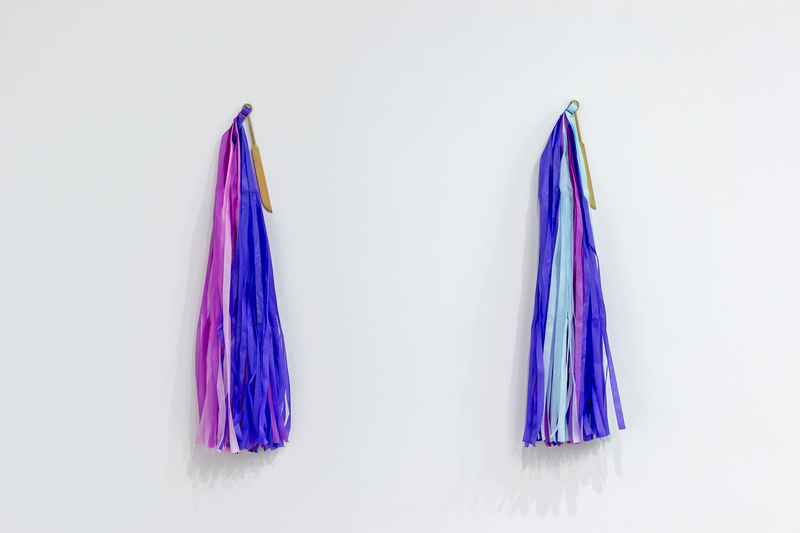 Intuition#1, Intuition#2, brass, paper, thread, 90x20x10cm. 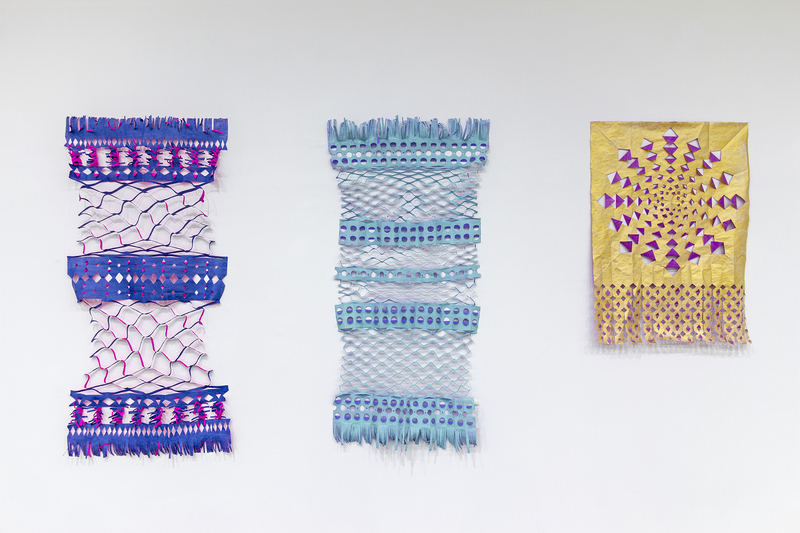 Mediator#1, Mediator#2, Mediator#3, pigments on paper. 130x70cm, 130x70cm, 90x70cm. 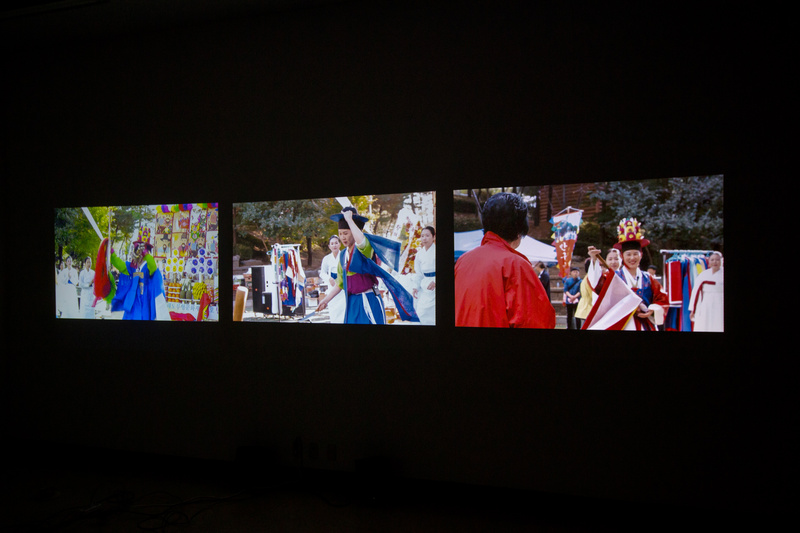 3 channel video installation at MMCA Changdong, Seoul. 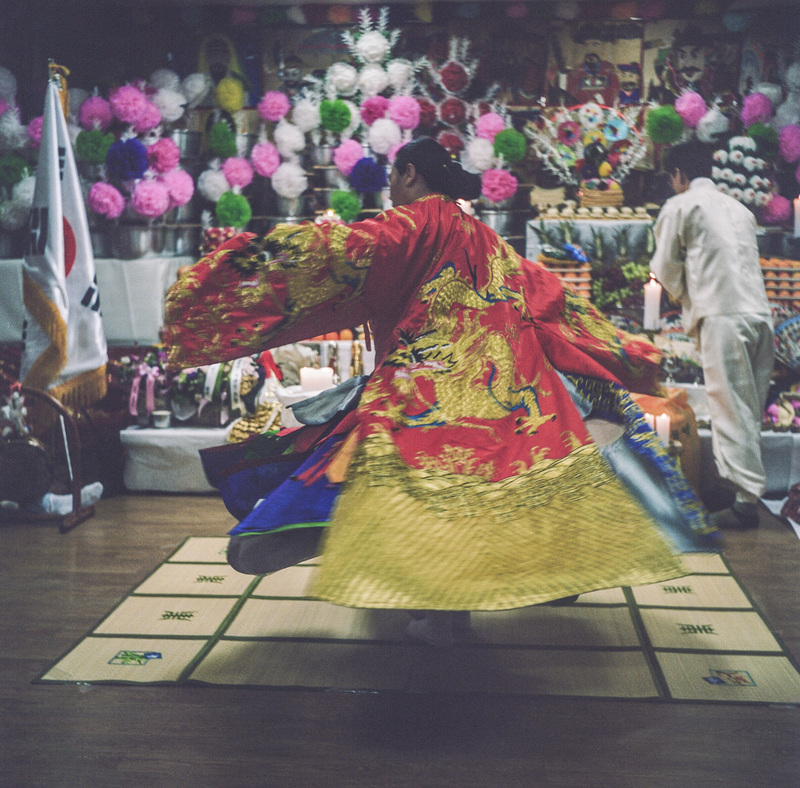 Manshin Kim Nam-Sum carrying out a private ritual in a gutdang near Kookmin University, Seoul. 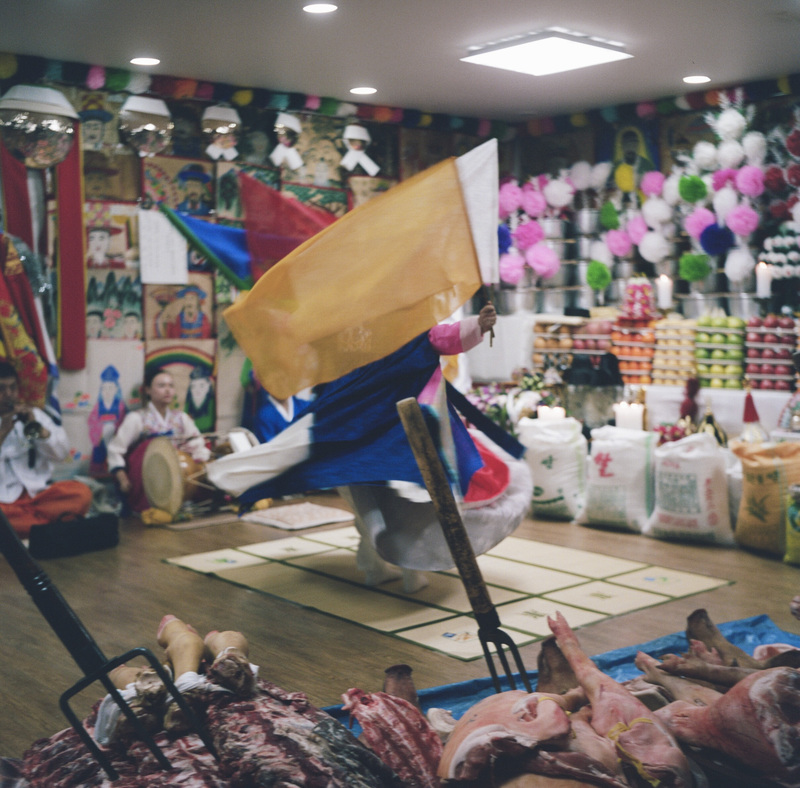 Two members from the team of Kim Nam-Sum carrying out a private ritual in a gutdang near Kookmin University, Seoul. 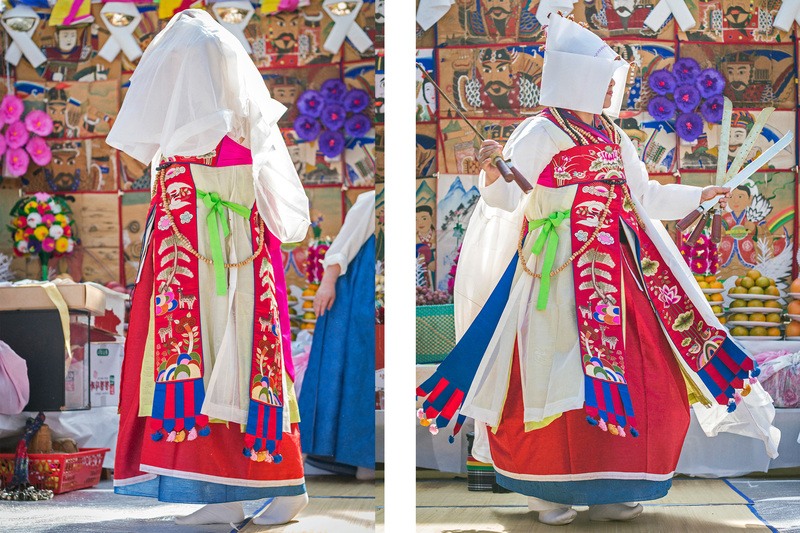 Manshin Kim Keum-Hwa at her shrine in Ganghwado, South Korea. 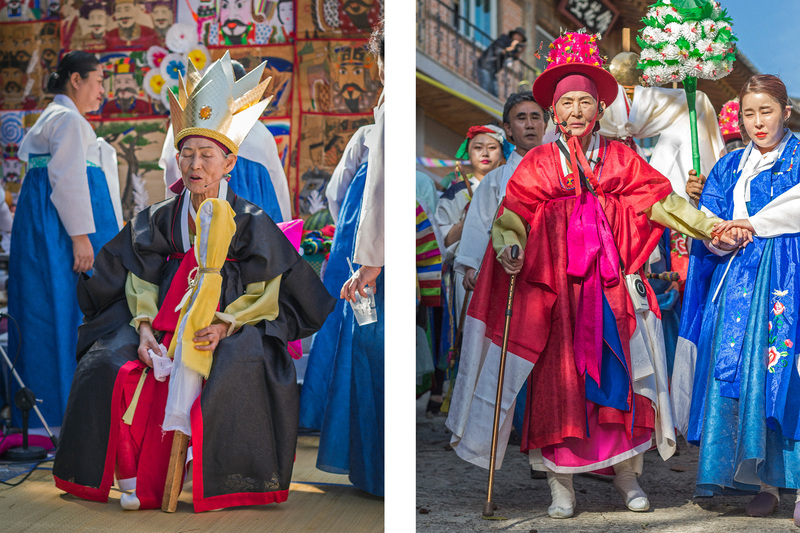 On a Sunny Friday afternoon I got the chance to meet for the first time Korea’s “national” shaman Kim Keum-Hwa at her Geumhwadang Institute, on Ganghwa Island. Since she’s a spirit mother to many disciples, most people just call her mama. 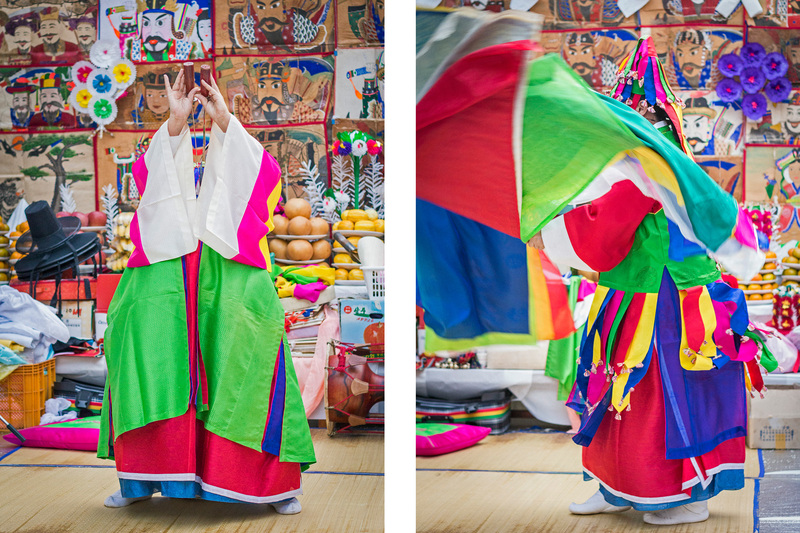 Her efforts preserving and spreading shamanism throughout Korea and the rest of the world are simply incalculable, and today she’s a renowned charismatic shaman and a celebrity in her country. In times when shamanism was brutally persecuted this powerful woman escaped abuse and extreme poverty. 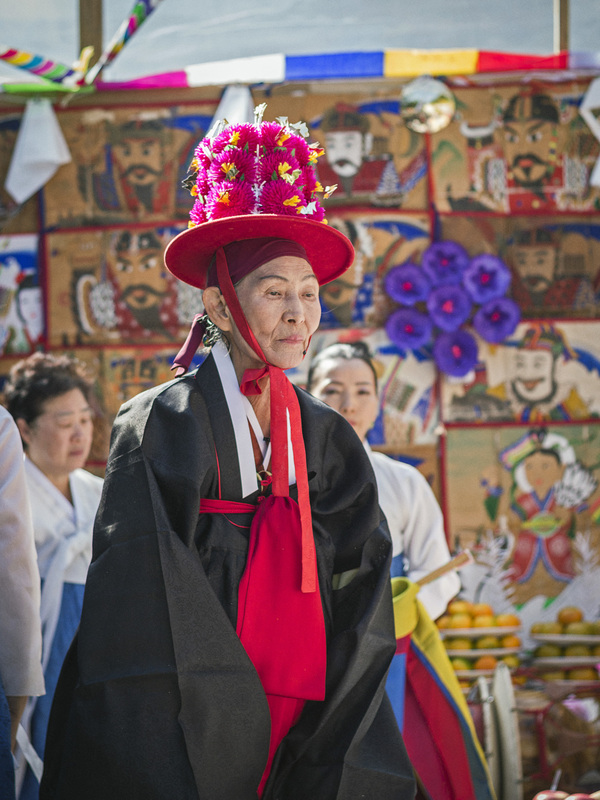 Now she’s a well respected figure, designated by the national government as an “intangible cultural treasure” and concerned with pressing political and social issues such as Korean reunification or environmental protection. Spending a few days at her shrine, chatting with her and participating at a unique three days ritual to bless her 70th anniversary as a shaman was an honour and an unforgettable experience. I was also lucky to meet some of the members of her team who were extremely generous to me and helped me further into my project, asking nothing in return. Being able to capture her graceful presence in this intimate portrait was mama’s generous present to me. 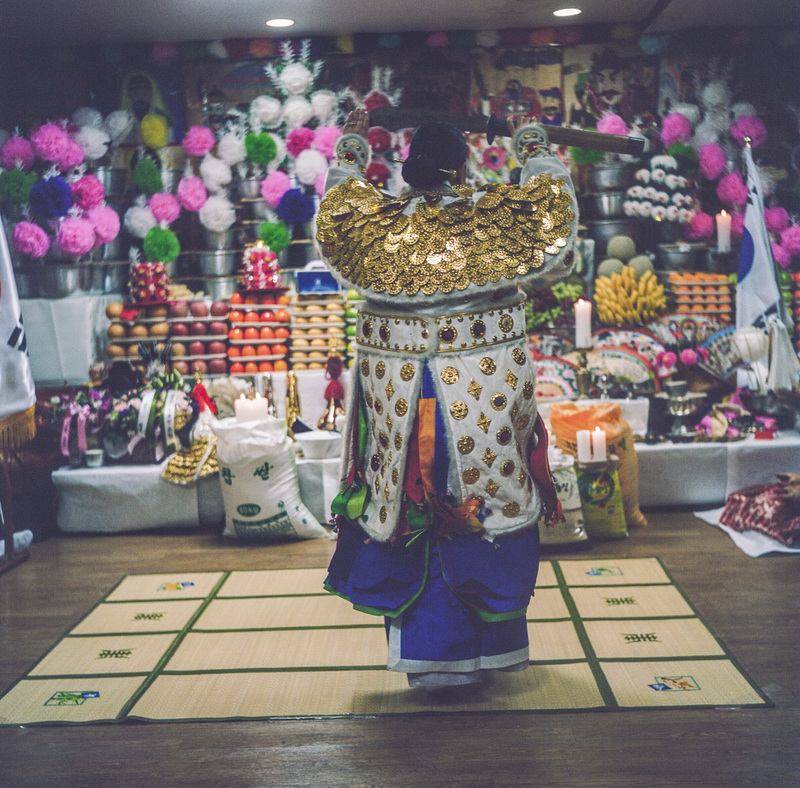 Manshin Kim Keum-Hwa getting ready before a ritual at her shrine in Ganghwado, South Korea. 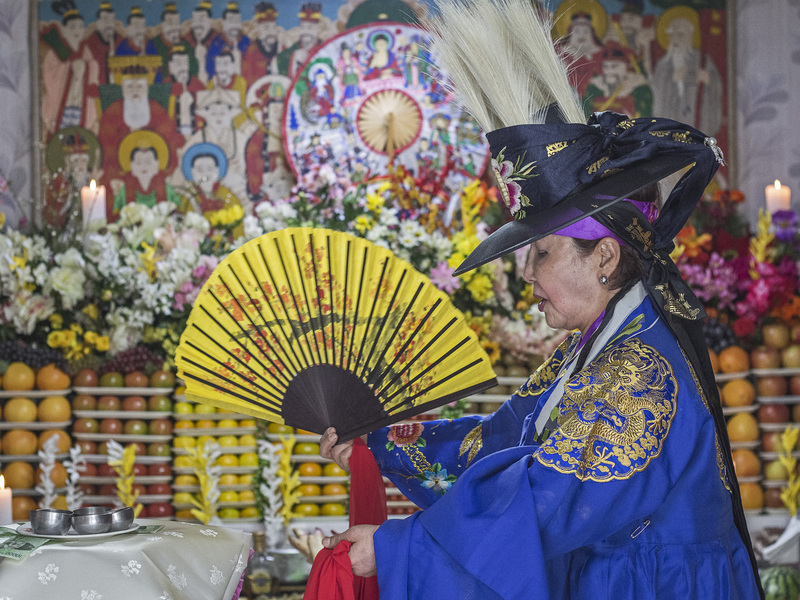 Offering during a ritual at Kim Keum-Hwa’s shrine in Ganghwado, South Korea. 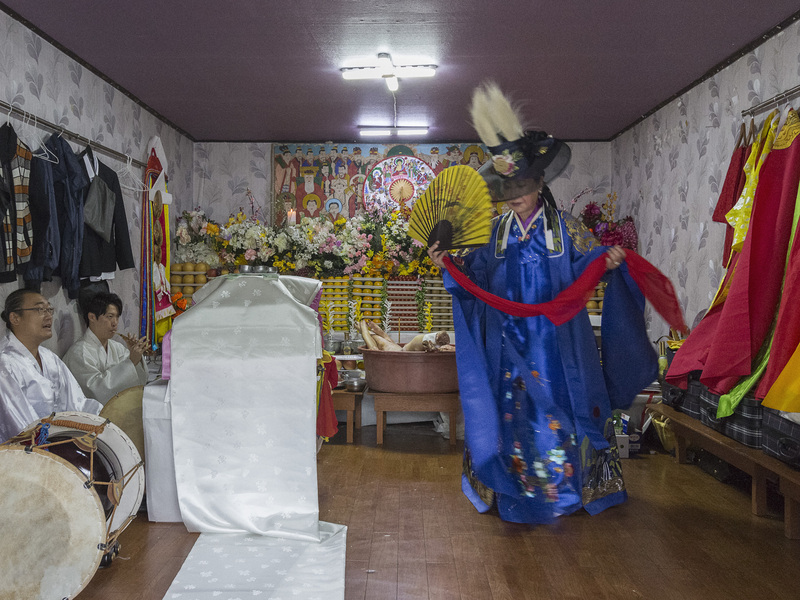 Members from the team of Kim Keum-Hwa carrying out a ritual at her shrine in Ganghwado, South Korea. 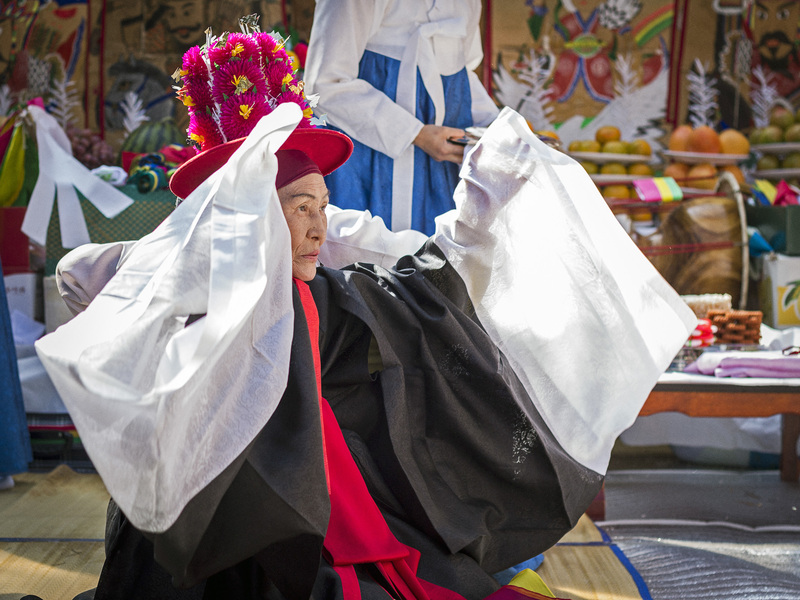 Manshin Kim Hee Ok carrying out a private ritual at the Guksadang Shrine on Inwangsan Mountain, Seoul. 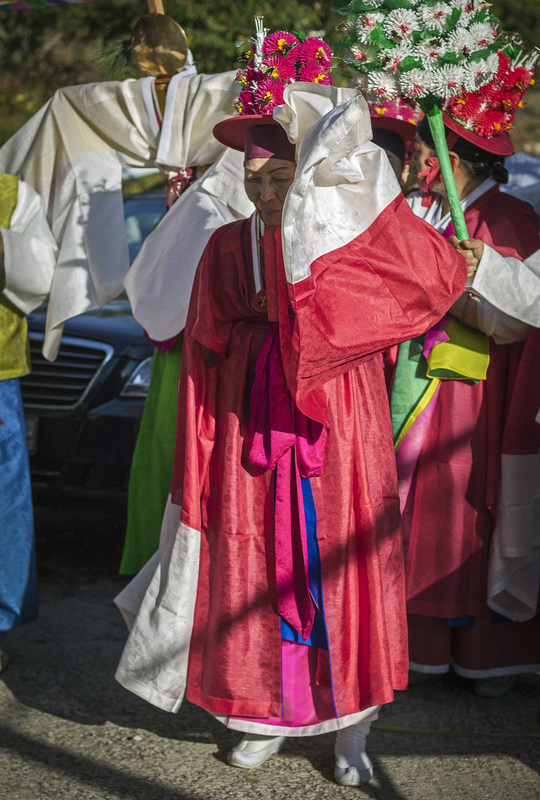 Manshin Min Hye-Gyeong before carrying out a public ritual at Namhansanseong Mountain near Seoul. 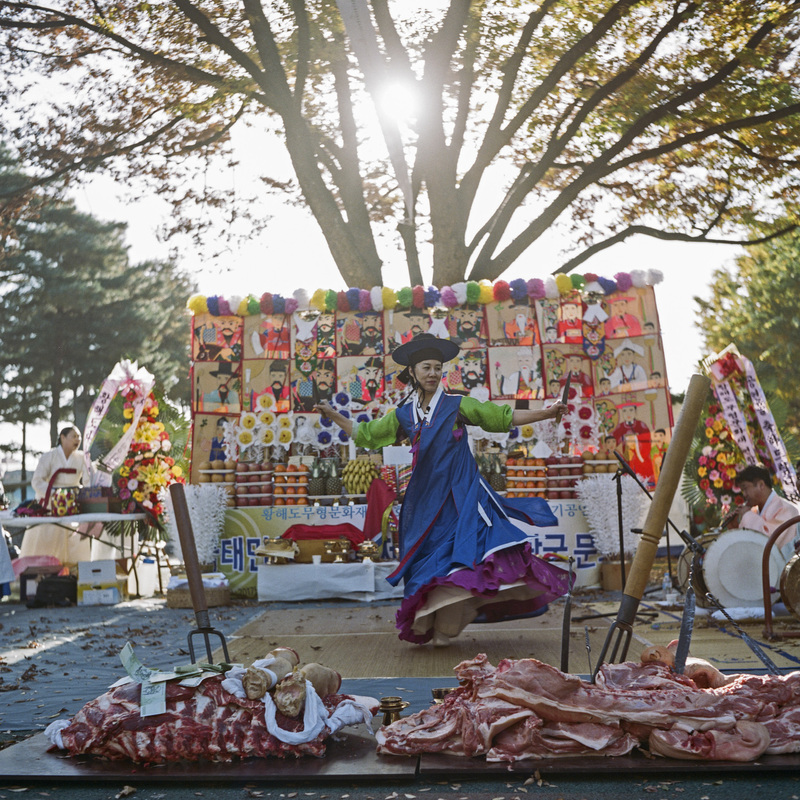 Manshin Min Hye-Gyeong carrying out a public ritual at Namhansanseong Mountain near Seoul. 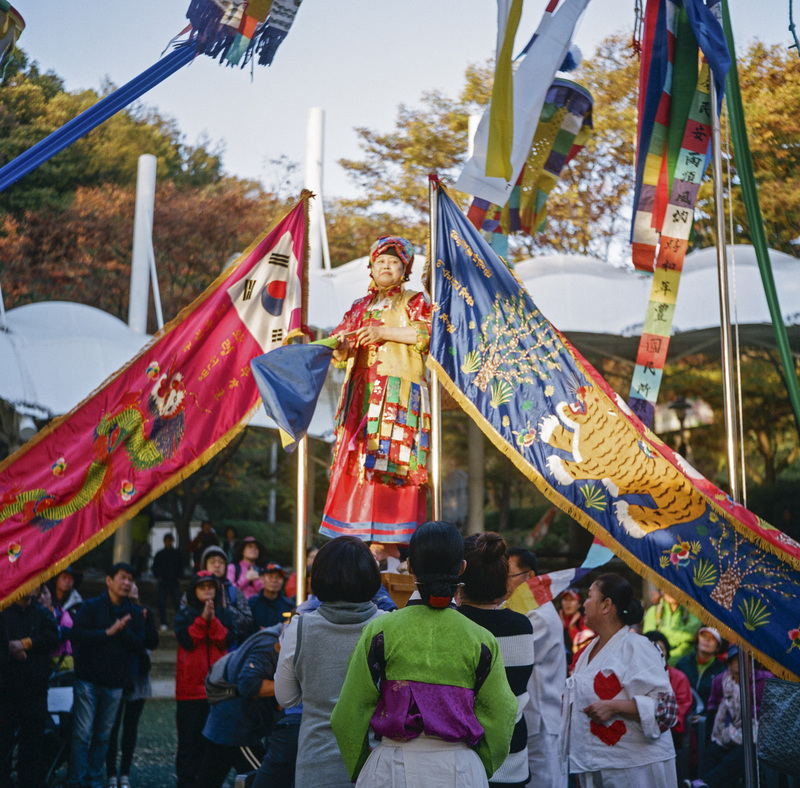 Public ritual at Namhansanseong Mountain near Seoul. 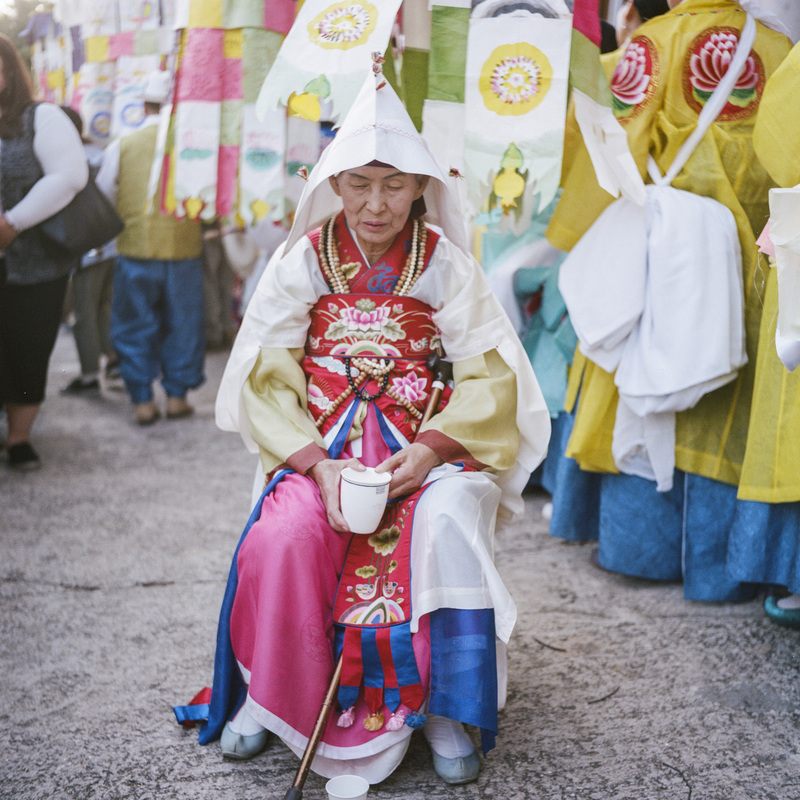 Manshin Jeong Soon Deok taking a rest in between a ritual in a gutdang outside Seoul. 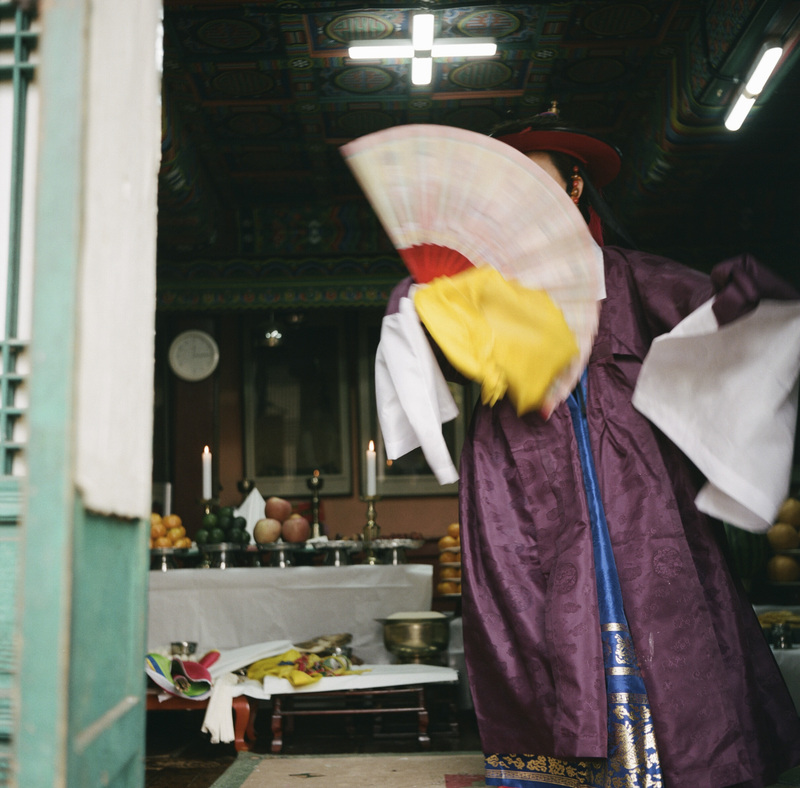 Shaman Jeong Soon Deok was born in 1967 into a family that had just moved from North Korea at the time of the Korean War. At the age of 5 her father died and she contracted measles. The infection turned into a long drawn out illness that later on would be diagnosed as Shinbyeong, the spirit-sickness. 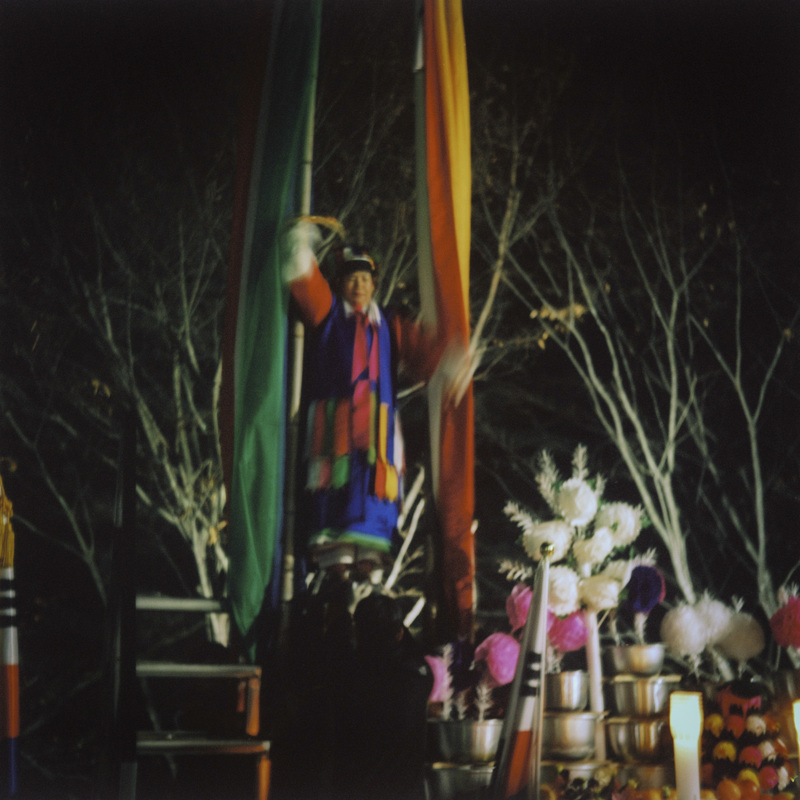 Jeong Soon Deok would have episodes of hallucinations in which an old man in a white robe and black hat riding a white horse called her name and gave her a long knife, a fan and a bundle of brass bells, iconic shamanic objects. An old woman who lived next door found her trembling after such hallucinations, and quickly identified these episodes as clear shaman-destiny signs. 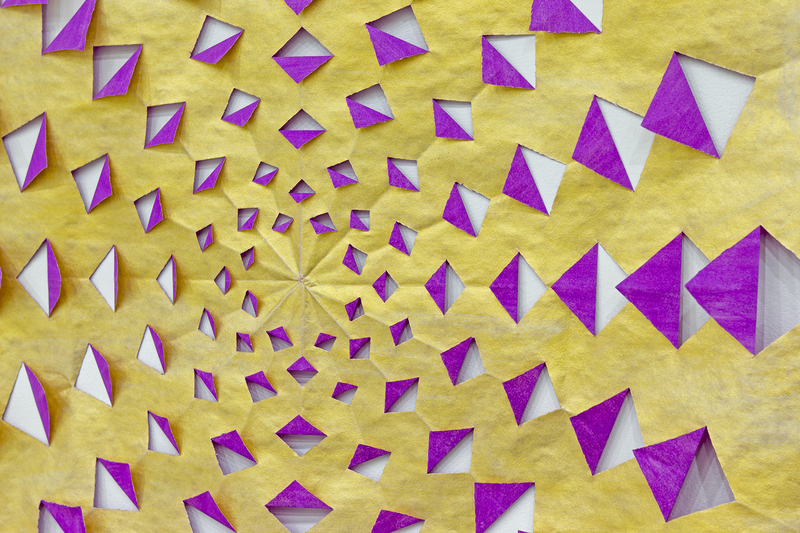 At the beginning, her mother refused such destiny, until a near-death experience of her daughter changed her mind. 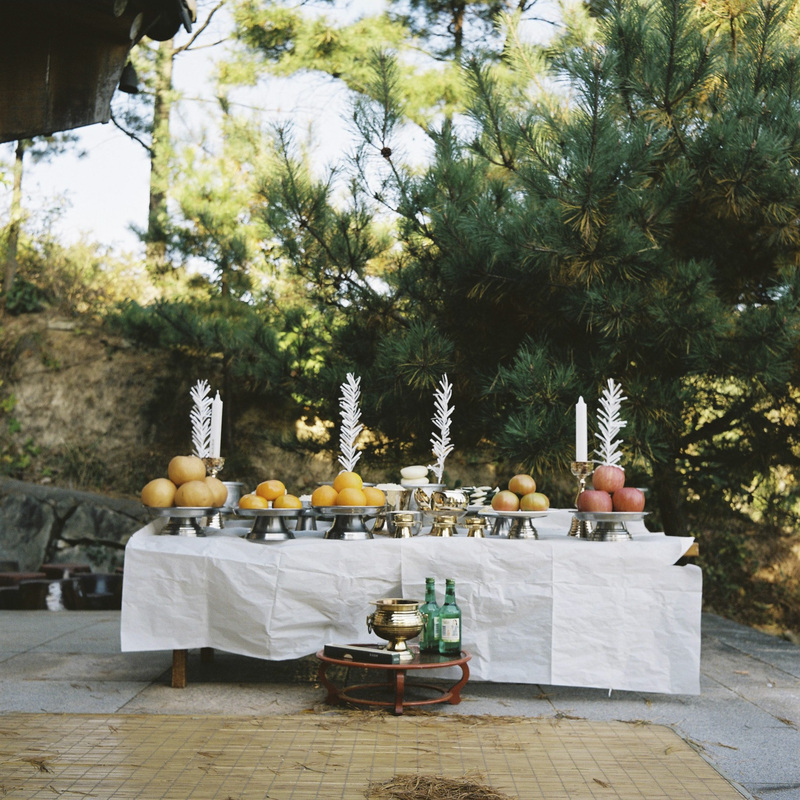 Jeong Soon Deok’s father happened to also be a shaman, and although he didn’t perform rituals, he kept a small shrine at home. 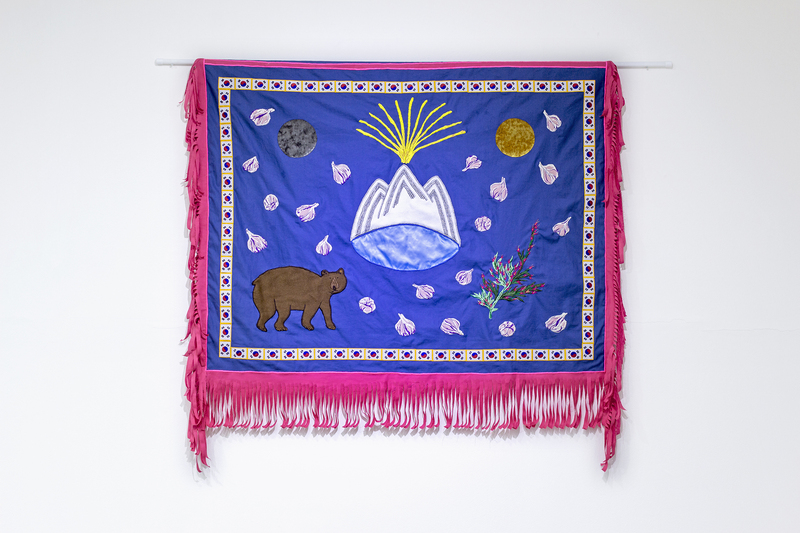 Before her father died, all this shamanic paraphernalia was buried in a mountain near by. 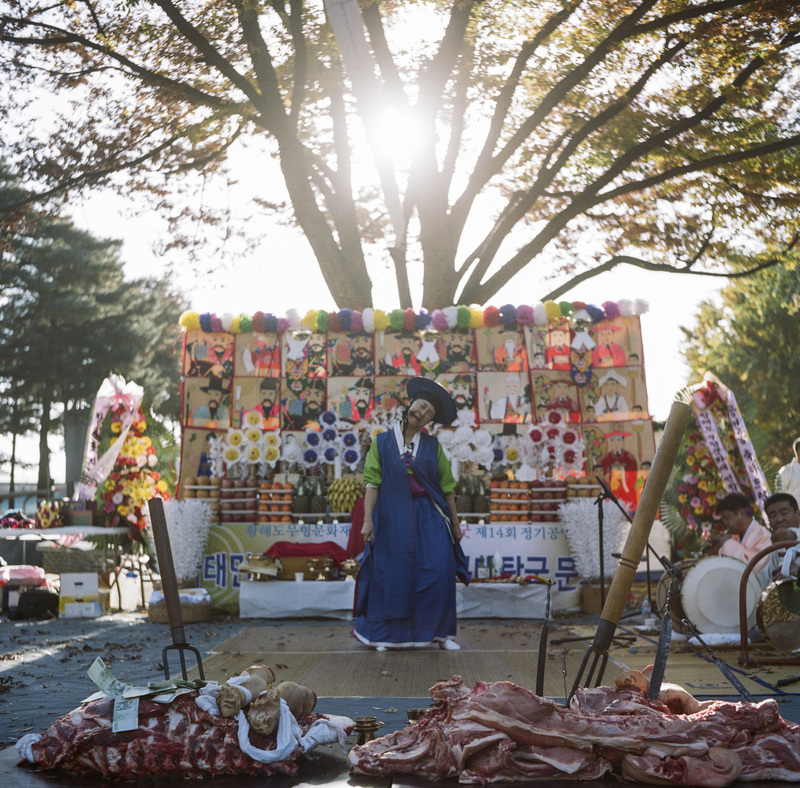 Despite not being aware of this fact, left alone the burial location, Jeong Soon Deok found these objects right before her initiation ritual at the early age of 8, when she became a shaman. 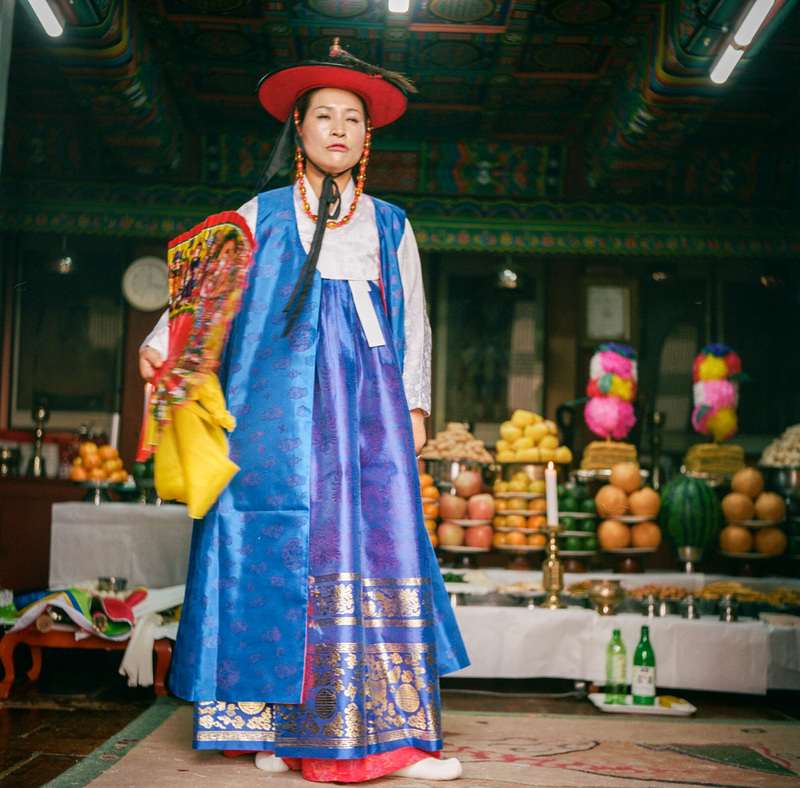 At the age of 14 she moved to Seoul, in part thanks to the help of a powerful businessman who was impressed by her accurate divinations. 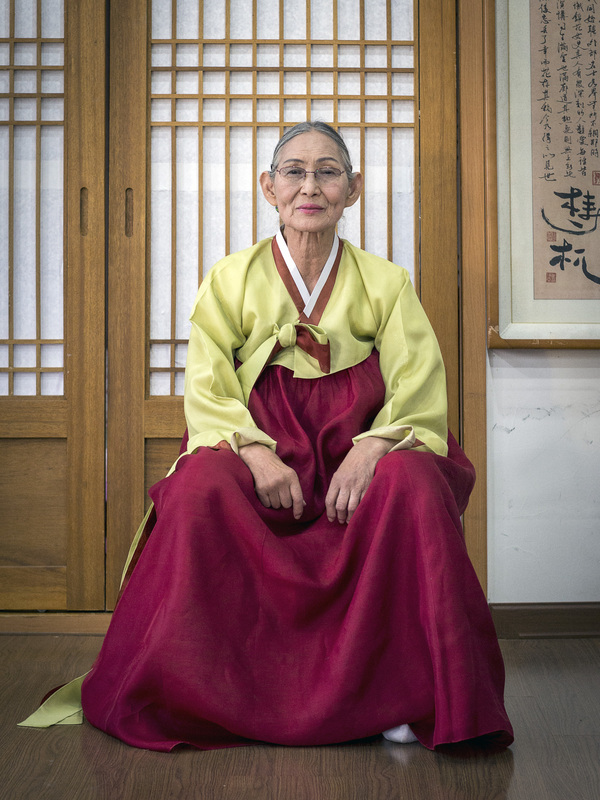 When she was only 16, she became the most promising apprentice of master Korean shaman and Living National Treasure Kim Keum-Hwa. 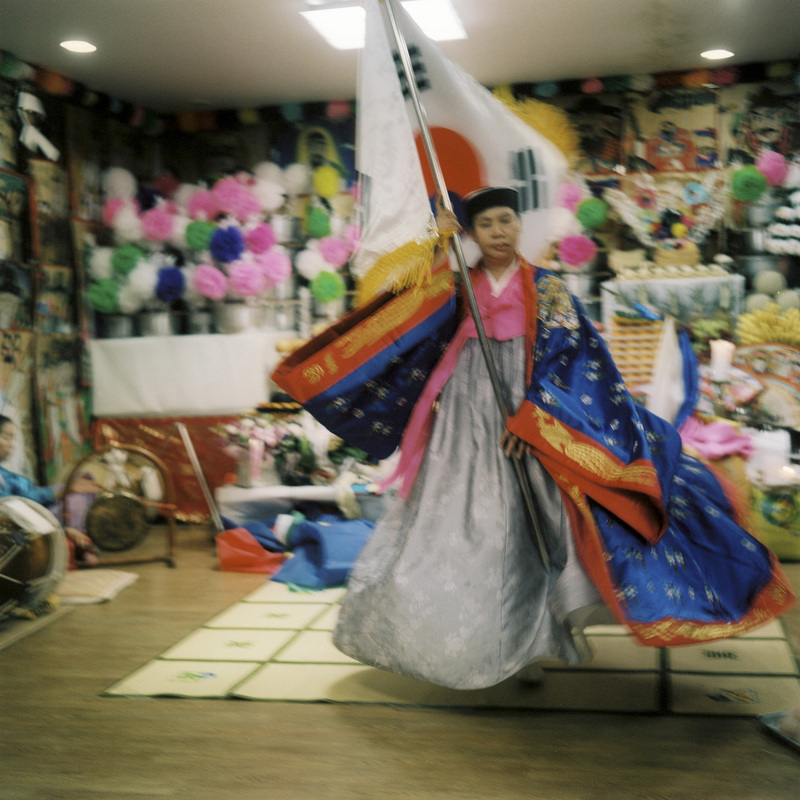 Later on, Jeong Soon Deok would build her own identity as a minjung mudang (a shaman for the people), cooperating with the student pro-democracy movement and even performing for those who were tortured or died in the hands of the military dictatorship. Jeong Soon Deok established herself as a national hero in the eyes of the pro-democracy and Popular Culture Movement groups. The text above is a compilation of different excerpts from Dr. Kim Dong Kyu, Senior Ressearcher at the Institute for the Study of Religion (ISR), Sogang University. 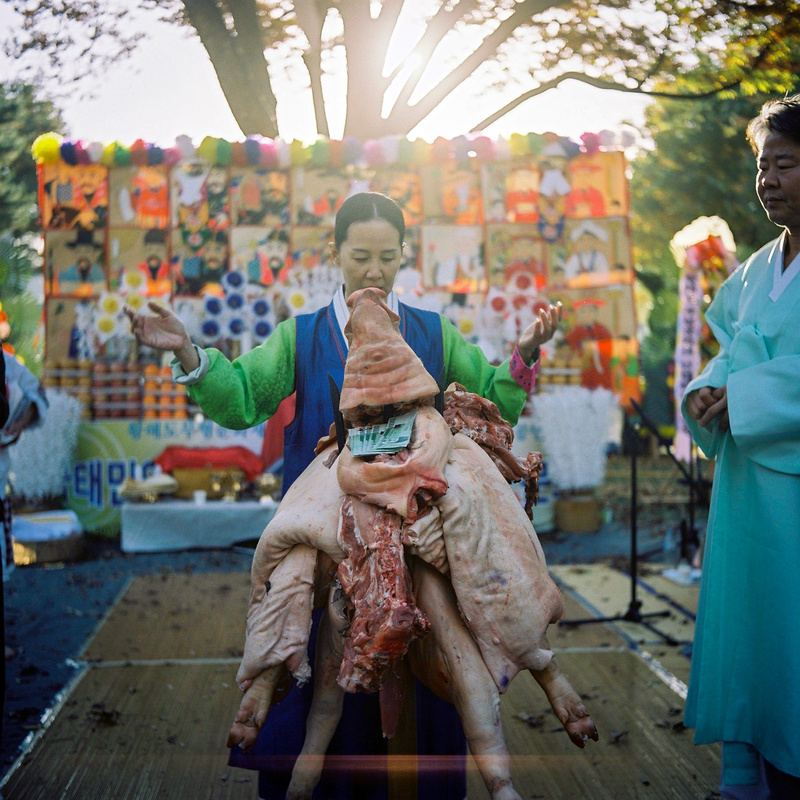 Manshin Jeong Soon Deok carrying out a ritual in a gutdang outside Seoul.